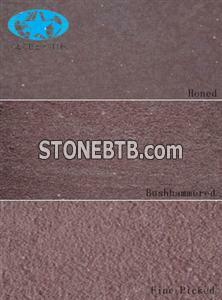 Ruby Sandstone is a mauve sandstone without veins, and different surface finishs appears different red colors. Ruby Sandstone is a kind of rare hard Sandstone in all of Chinese Sandstone.Ruby Sandstone can be processed surface finish like Polished, Honed, Sandblast, Flamed, Bush-hammered, Chiseled, Nature Spilted, ect, and also can be made into Sandstone mushroom Stone. Ruby Sandstone are widely used in Hotel, Apartment, Villa, Commercial building, Office Building as Sandstone Flooring Tile, Sandstone Wall Tile, Sandstone Cladding Tile and all kinds of Architecture stone and Construction stone. Ruby Sandstone can be cut into the thin tile 305X505X10mm. You can visit our website to see more Sandstone Colors. Company Name :Xiamen Globe Faith Inc.
We habe 100 m2 Tile and 50 m2 Slab Blue Vein in stock.